The modern combine harvester, or simply combine, is a versatile machine designed to efficiently harvest a variety of grain crops. The name derives from its combining three separate harvesting operations—reaping, threshing, and winnowing—into a single process. Among the crops harvested with a combine are wheat, oats, rye, barley, corn (maize), sorghum, soybeans, flax (linseed), sunflowers and canola. The separated straw, left lying on the field, comprises the stems and any remaining leaves of the crop with limited nutrients left in it: the straw is then either chopped, spread on the field and ploughed back in or baled for bedding and limited-feed for livestock. 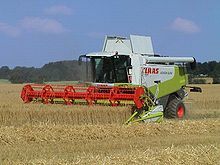 Combine harvesters are one of the most economically important labour saving inventions, significantly reducing the fraction of the population engaged in agriculture. In 1826 in Scotland, the inventor Reverend Patrick Bell designed (but did not patent) a reaper machine, which used the scissors principle of plant cutting – a principle that is still used today. The Bell machine was pushed by horses. A few Bell machines were available in the United States. In 1835, in the United States, Hiram Moore built and patented the first combine harvester, which was capable of reaping, threshing and winnowing cereal grain. Early versions were pulled by horse, mule or ox teams. In 1835, Moore built a full-scale version with a length of 5.2 m (17 ft), cut width of 4.57 m (15 ft) and by 1839, over 20 ha (50 acres) of crops were harvested. This combine harvester was pulled by 20 horses fully handled by farmhands. By 1860, combine harvesters with a cutting, or swathe, width of several metres were used on American farms. A parallel development in Australia saw the development of the stripper based on the Gallic stripper, by John Ridley and others in South Australia by 1843. The stripper only gathered the heads, leaving the stems in the field. The stripper and later headers had the advantage of less moving parts and only collecting heads, requiring less power to operate. Refinements by Hugh Victor McKay produced a commercially successful combine harvester in 1885, the Sunshine Header-Harvester. In 1911, the Holt Manufacturing Company of California produced a self-propelled harvester. In Australia in 1923, the patented Sunshine Auto Header was one of the first center-feeding self-propelled harvesters. In 1923 in Kansas, the Baldwin brothers and their Gleaner Manufacturing Company patented a self-propelled harvester that included several other modern improvements in grain handling. Both the Gleaner and the Sunshine used Fordson engines; early Gleaners used the entire Fordson chassis and driveline as a platform. In 1929, Alfredo Rotania of Argentina patented a self-propelled harvester. International Harvester started making horse-pulled combines in 1915. At the time, horse powered binders and stand alone threshing machines were more common. In the 1920s, Case Corporation and John Deere made combines and these were starting to be tractor pulled with a second engine aboard the combine to power its workings. The world economic collapse in the 1930s stopped farm equipment purchases, and for this reason, people largely retained the older method of harvesting. A few farms did invest and used Caterpillar tractors to move the outfits. In the U.S., Allis-Chalmers, Massey-Harris, International Harvester, Gleaner Manufacturing Company, John Deere, and Minneapolis Moline are past or present major combine producers. In 1937, the Australian-born Thomas Carroll, working for Massey-Harris in Canada, perfected a self-propelled model and in 1940, a lighter-weight model began to be marketed widely by the company. Lyle Yost invented an auger that would lift grain out of a combine in 1947, making unloading grain much easier. In 1952 Claeys launched the first self-propelled combine harvester in Europe; in 1953, the European manufacturer Claas developed a self-propelled combine harvester named 'Hercules', it could harvest up to 5 tons of wheat a day. This newer kind of combine is still in use and is powered by diesel or gasoline engines. Until the self-cleaning rotary screen was invented in the mid-1960s combine engines suffered from overheating as the chaff spewed out when harvesting small grains would clog radiators, blocking the airflow needed for cooling. A significant advance in the design of combines was the rotary design. The grain is initially stripped from the stalk by passing along a helical rotor, instead of passing between rasp bars on the outside of a cylinder and a concave. Rotary combines were first introduced by Sperry-New Holland in 1975. Dummy heads or pick-up headers feature spring-tined pickups, usually attached to a heavy rubber belt. They are used for crops that have already been cut and placed in windrows or swaths. This is particularly useful in northern climates such as western Canada, where swathing kills weeds resulting in a faster dry down. While a grain platform can be used for corn, a specialized corn head is ordinarily used instead. The corn head is equipped with snap rolls that strip the stalk and leaf away from the ear, so that only the ear (and husk) enter the throat. This improves efficiency dramatically, since so much less material must go through the cylinder. The corn head can be recognized by the presence of points between each row. Self-propelled Gleaner combines could be fitted with special tracks instead of tires or tires with tread measuring almost 10in deep to assist in harvesting rice. Some combines, particularly the pull type, have tires with a diamond tread which prevents sinking in mud. These tracks can fit other combines by having adapter plates made. Secondarily, leveling changes a combine's center of gravity relative to the hill and allows the combine to harvest along the contour of a hill without tipping, a danger on the steeper slopes of the region; it is not uncommon for combines to roll over on extremely steep hills. Newer leveling systems do not have as much tilt as the older ones. A John Deere 9600 combine equipped with a Rahco hillside conversion kit will level to 44%, while the newer STS combines will only go to 35%. These modern combines use the rotary grain separator which makes leveling less critical. Most combines on the Palouse have dual drive wheels on each side to stabilize them. 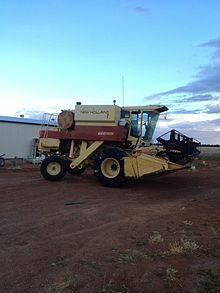 Despite great advances in mechanics and computer control, the basic operation of the combine harvester has remained unchanged almost since it was invented. First, the header, described above, cuts the crop and feeds it into the threshing cylinder. This consists of a series of horizontal rasp bars fixed across the path of the crop and in the shape of a quarter cylinder. Moving rasp bars or rub bars pull the crop through concaved grates that separate the grain and chaff from the straw. The grain heads fall through the fixed concaves. What happens next is dependent on the type of combine in question. In most modern combines, the grain is transported to the shoe by a set of 2, 3, or 4 (possibly more on the largest machines) augers, set parallel or semi-parallel to the rotor on axial mounted rotors and perpendicular on "Axial Flow" combines. In older Gleaner machines, these augers were not present. Those combines are unique in that the cylinder and concave is set inside feederhouse instead of in the machine directly behind the feederhouse. Consequently, the material was moved by a "raddle chain" from underneath the concave to the walkers. The clean grain fell between the raddle and the walkers onto the shoe, while the straw, being longer and lighter, floated across onto the walkers to be expelled. On most other older machines, the cylinder was placed higher and farther back in the machine, and the grain moved to the shoe by falling down a "clean grain pan", and the straw "floated" across the concaves to the back of the walkers. Rather than immediately falling out the rear of the combine at the end of the walkers, there are models of combine harvesters from Eastern Europe and Russia (e.g. Agromash Yenisei 1200 1 HM, etc.) that have a "straw catchers" at the end of the walkers that temporarily hold the straw and then once full, deposit it in a stack for easy gathering. John Deere Combine harvesters being transported by railway on flat cars in Tyrone, Pennsylvania in the United States. ^ Constable, George; Somerville, Bob (2003). A Century of Innovation: Twenty Engineering Achievements That Transformed Our Lives, Chapter 7, Agricultural Mechanization. Washington, DC: Joseph Henry Press. ISBN 0-309-08908-5. ^ Biographical Dictionary of the History of Technology. Taylor & Francis. ^ "The History of Combine Harvesters". Cornways. ^ Remarkable Australian Farm Machines, Graeme R. Quick, Rosenberg Publishing, 2007, page 72. ^ "Farmindustrynews.com". Archived from the original on 2008-10-23. Retrieved 2009-11-15. This page was last edited on 11 April 2019, at 23:08 (UTC).